Recent Changes: See the Current Status page for a listing of changes to the dataset. Data Access: See the Available Data page for quick access to the dataset. The 4 km AVHRR Pathfinder Version 5 SST Project (Pathfinder V5) is a new reanalysis of the AVHRR data stream developed by the University of Miami's Rosenstiel School of Marine and Atmospheric Science (RSMAS) and the NOAA National Oceanographic Data Center (NODC). In partnership with NODC and RSMAS is NASA's Physical Oceanography Distributed Active Archive Center (PO.DAAC), which has years of experience serving and developing earlier versions of the Pathfinder dataset. Currently in the third year of a three-year demonstration effort, it is hoped that this system can be implemented as an ongoing effort as part of a broader SST climate data record system. This reprocessing uses an improved version of the Pathfinder algorithm and processing steps to produce twice-daily global SST and related parameters back to 1981, at a resolution of approximately 4 km, the highest possible for a global AVHRR data set. Temporal averages for 5-day, 7-day, 8-day, Monthly, and Yearly periods are also produced. 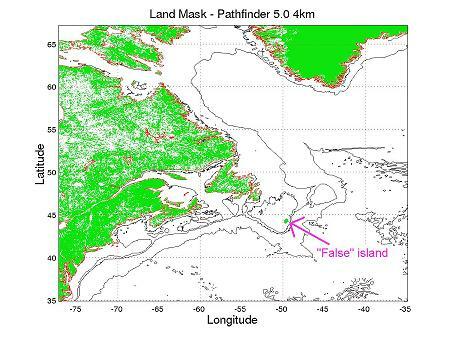 Current key improvements over the original 9 km Pathfinder SST data set include a more accurate, consistent land mask, higher spatial resolution, and inclusion of sea ice information. Additional improvements including better flagging of aerosol-contaminated retrievals and the provision of wind and aerosol ancillary data will be implemented in a future Version 6 reprocessing. See http://www.nodc.noaa.gov/SatelliteData/pathfinder4km for more information. Kilpatrick, K.A., G.P. Podesta and R. Evans (2001). Overview of the NOAA/NASA Advanced Very High Resolution Radiometer Pathfinder algorithm for sea surface temperature and associated matchup database, Journal of Geophysical Research-Oceans, 106 (C5): 9179-9197 MAY 15 2001. Despite its success, some problems with the V4 data set limited its use. For example, biases are known to exist in areas strongly impacted by atmospheric aerosols. Additionally, the relatively crude landmask created significant problems for coastal applications and lack of sea ice information limits the use of the data in the ice-prone high latitudes. This new reprocessing by RSMAS/NODC seeks to correct these deficiencies and provide a higher resolution and ultimately more accurate SST product by the end of the three-year effort. 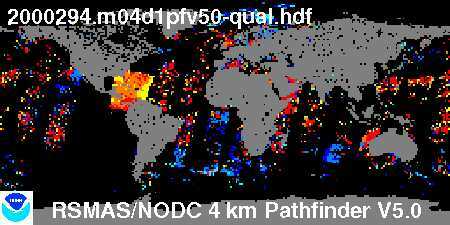 This global 4 km resolution dataset is termed "Pathfinder Version 5 (V5)" since it builds directly on the V4 dataset, including the use of the same set of matchup coefficients. The following table describes which NOAA polar orbiting satellites were used in the Pathfinder Version 5 processing for SST. The table gives dates in both YYYYDDD format (4 digit year followed by 3 digit day of year) and YYMMDD format (2 digit year, 2 digit month, 2 digit day of month). NOAA-7    1981236 - 1985003   810824 - 850103      "afternoon"
NOAA-9    1985004 - 1988312   850104 - 881107      "afternoon"
NOAA-11   1988313 - 1994256   881108 - 940913      "afternoon"
NOAA-9    1994257 - 1995021   940914 - 950121      "afternoon"
NOAA-14   1995022 - 2000285   950122 - 001011      "afternoon"
NOAA-16   2000286 - 2002365   001012 - 021231      "afternoon"
NOAA-17   2003001 - 2005155   030101 - 050604      "morning"
NOAA-18   2005156 - 2006365   050605 - 061231      "afternoon"
Podesta, G.P., M. Arbelo, R. Evans, K. Kilpatrick, V. Halliwell, and J. Brown (2003). Errors in high-latitude SSTs and other geophysical products linked to NOAA-14 AVHRR channel 4 problems, Geophysical Research Letters , vol 30, no 11., 1548, doi: 10.1029/2003GL017178. Up to date information on the status of the NOAA polar orbiting satellites can be found at the NOAA Office of Satellite Operations POES Status web site and from the Weekly NOAA Polar Orbiting Spacecraft Status Reports. A common question about the Pathfinder SSTs concerns the time of observation for each pixel. This question is a complicated one because there are several factors to consider, some having to do with the satellite orbits and some having to do with the manner in which the data are processed. Each satellite in the NOAA polar orbiting satellite series was launched in a specific orbit, with specified ascending and descending node times (the ascending node time is the time when the satellite passes from south to north over the equator and the descending node time is when it passes from north to south over the equator). Each orbit requires about 102 minutes to complete, and the swaths observed by the satellite overlap, resulting in possibly multiple observations from multiple orbits at any given spot on Earth. This overlap is more pronounced at higher latitudes. Since the Pathfinder algorithm combines the multiple observations (as long as they have they same quality level), the actual time of observation of any given pixel is not known precisely. While an average, or median, time could be determined during the processing, it would require some significant changes to the processing code making it difficult to carry out under the current funding situation. To complicate matters, the actual orbits of the satellites drift over time, introducing a temporal component as well. The table below (assembled from information in Table 1.2-1 of the NOAA Polar Orbiter Data User's Guide and Weekly NOAA Polar Orbiting Spacecraft Status Reports) shows the Local Solar Times (LST) at launch and the values they had drifted to by later dates for the satellites used in the Version 5 Pathfinder algorithm. Drift rates are also given if known. In addition to the SST values, the Pathfinder V5 Project is making several other useful parameters available. Among other uses, these parameters can be used to calculate higher-order statistics, examine in detail the quality tests passed and failed, and to individually determine what consitutes a "good" SST value by selecting SSTs based on their overall quality assignment. The seven parameters currently available are listed below. The all-pixel SST files contain values for each pixel location, including those contaminated with clouds or other sources of error. The Overall Quality Flag values may be used to filter out these unwanted values. The SST value in each pixel location is an average of the highest quality AVHRR Global Area Coverage (GAC) observations available in each roughly 4 km bin. The Pathfinder algorithm uses a first guess SST based on the Reynolds Optimally Interpolated SST (OISST), Version 2 product. The OISST V2 is also used in the quality control procedures. This parameter indicates the number of AVHRR GAC observations falling in each approximately 4 km bin. This is the standard deviation of the observations in each 4 km bin. The overall quality flag is a relative assignment of SST quality based on a hierarchical suite of tests. The Quality Flag varies from 0 to 7, with 0 being the lowest quality and 7 the highest. For most applications, using SST observations with quality levels of 4 to 7 is typical. For applications requiring only the best-available observations (at the expense of the number of observations), use quality levels of 7 only. For more information regarding the suite of tests, see the Kilpatrick et al. (2001) paper cited above. These files contains a mask code, which along with Mask 2, can be to determine the tests in the hierarchical suite that were passed or failed, resulting in the Overall Quality Flag. These files contains a mask code, which along with Mask 1, can be to determine the tests in the hierarchical suite that were passed or failed, resulting in the Overall Quality Flag. Additionally, in the Version 6.0 data planned for future production, wind speeds and aerosol content will also be provided. The data are all stored in Hierarchical Data Format Verison 4 (HDF 4), using the Scientific Data Set (SDS) model. HDF-SDS is a self-describing format capable of storing multiple layers of data as well as metadata describing the file contents. The metadata contained within the HDF files do not conform to FGDC, COARDS, or other standards. However, complete FGDC metadata records are available from NODC for all of the formal Pathfinder data and climatologies (complete FGDC metadata is not currently planned for any of the interim data). HDF's capacity to chunk, or tile, the data is taken advantage of, with 512 by 512 element tiles. This internal compression scheme enables both efficient access to subsets of the data as well as enormous savings in disk volume required compared to uncompressed requirements. * - Note that the offset parameter in the Overall Quality Flag files is incorrectly set to a value of 1. The value of 0 listed here is correct. While not directly readable in most GIS systems, mechanisms are being developed to dynamically convert HDF files into suitable formats. NODC has also developed example web documentation for reading pre-screened Pathfinder HDF files into ArcGIS 10 and calculating annual means. This documentation can be found here. Upon request, NODC will convert specific files into GeoTIFF format (see http://remotesensing.org/geotiff/geotiff.html)* which is capable of being read by most GIS software. In addition to the provision of the seven parameters listed above (V4 only provides SST, number of observations, and quality flag), there are three key enhancements which distinguish the new V5 data from the older V4 data: improved resolution, ice mask identification, and improved land mask. These areas are discussed below. While High-Resolution Picture Transmission (HRPT) or Local Area Coverage (LAC) data exist for some parts of the world at roughly 1.1 km resolution, the GAC data at roughly 4.6 km are the highest resolution AVHRR data available globally. When mapped to an equal angle grid, this resolution results in an array of 8196 by 4096 pixels. This improved spatial resolution greatly enhances the utility of the Pathfinder V5 dataset in coastal zones and areas of strong SST gradients. A tiered approach to flagging pixels compromised by sea-ice is being taken. First, weekly ice-masks derived from the Special Sensor Microwave Imager (SSMI) and processed by Remote Sensing Systems, Inc. (RSS), are used to identify regions with ice concentrations exceeding 1% (in other words, if any ice is present the region is flagged as ice covered). Currently, RSS version 5 data are being used at 25 km resolution. These data are available back to July 1987. Prior to that time, the sea ice information from the Reynolds OISST V2 is used. Because SSMI sensor data are not valid near land, ice concentrations in coastal regions are not properly identified. These gaps are filled using the Reynolds OISST V2 data at 1-degree resolution. Finally, because some areas appear inconsistent (such as a gap right at the poles in the SSMI data), an automated approach to "backfilling" the ice mask into interior regions has been developed. Therefore, the first tier uses the SSMI data, the second tier uses the OISST V2 data, and the third tier fills gaps using an automated algorithm. This ice mask is then used to exclude those pixels from the calculation of the three week running mean internal reference check. Eventually, in Version 6 of the Pathfinder reprocessing efforts, ice masks will be used to flag the data as poor quality. The current Version 5 approach is intended as an intermediate step to reduce the likelihood of misclassified pixels (that is, SST pixels with high quality levels but falling on ice mask) and develop an understanding of the impact of the ice masking techniques on the dataset without requiring major changes to the processing system. The USGS dataset is at 1 km resolution so must be degraded to 4 km before use in the Pathfinder V5 processing. A liberal approach is taken so if any of the 16 USGS 1 km values within a given 4 km bin are identified as water, then the entire 4 km bin is classified as water in Pathfinder V5. Any isolated water pixels completely surrounded by land are then set to land to avoid extremely small inland water bodies which are likely to suffer land-contamination. Values of 1, 2, and 4 from the USGS dataset are selected to represent land; the remaining values (0, 3, 5-7) are classified as water. The result is a global array (8192 x 4096 pixels) of land/water classifications. This file, in which land points have a value of 2, and water a value of 0, may be accessed by following this link: pfv50_land.m04.hdf. In the Pathfinder V5 processing, SSTs and quality levels are not calculated for pixels falling on land. These areas are assigned an SST pixel value of 0 (SST=-3.0) and quality flag of 0. DAYNIGHT = Indicates nighttime (1 or 4) or daytime (2 or 3) observations. Within Pathfinder, all satellite used prior to NOAA-17 are "afternoon" satellites, which means their daytime observations fall around 2 pm in the afternoon. NOAA-17 is a "morning" satellite, meaning its daytime observations are made around 10 am. Thus, two codes are needed for both day and night. This convention is consistent with NASA Aqua (an afternoon satellite) and NASA Terra (a morning satellite), which also use these codes. BITS = Number of bits in each pixel. Only present for 16-bit files (-16b). Note that this piece is dropped completely for all 2003 and more recent data, as well as the V5.1 data for 1981-early 1985. A daily, nighttime all-pixel SST file with 16-bit pixel values at 4 km resolution from 1990, day 182. The number of observations in a 5-day, nighttime mean at 4 km resolution using observations from 1994, days 181-185. 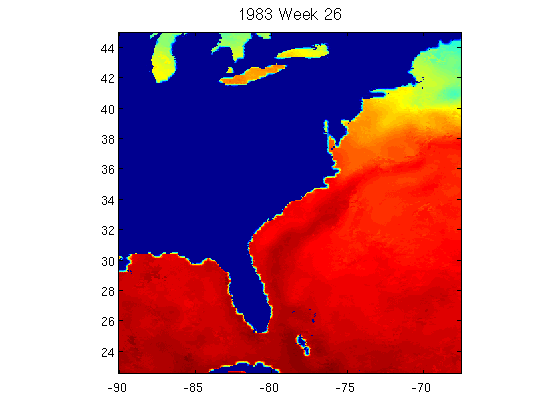 The overall quality flag values for the weekly, daytime mean SST for 1994, week 35, at 4 km resolution. The first-guess SST field used to create the 8-day mean SST for year 1991, days 169-176. The data have a spatial resolution of 4 km and are stored as 16 bit unsigned integers. The standard deviation of the monthly mean nighttime SST for April 1990, at 4 km resolution, stored in 16-bit format. Direct FTP Access: This is a good approach if you know what you want and have a large number of files you want to download. Simply point your favorite ftp client to ftp://ftp.nodc.noaa.gov/pub/data.nodc/pathfinder and begin downloading files. Simple Web Access: Simply click on http://data.nodc.noaa.gov/pathfinder and begin browsing through the file hierarchy. Clicking on any of the files will prompt you to download that file or will launch any application you might have associated with HDF files. If you want to just take a look around and see what is there, or if you know which file or small number of files you want to download, then this is a good approach. OPeNDAP Access: These data are also served using OPeNDAP (formerly DODS) server so you may access all of these data using that distributed data access system. The base URL is http://data.nodc.noaa.gov/opendap/pathfinder In addition, you may simply follow the links provided in the table on the Available Data page to access the OPeNDAP directory listings. For a listing of OPeNDAP clients which you can use to access the 4 km Pathfinder data (as well as any other OPeNDAP-enabled data sets), please see the OPeNDAP web site and follow the link called "Download". Examine the list of "Clients" for various mechanisms to access and display the data directly using OPeNDAP. For example, the OPeNDAP Data Connector is an excellent standalone client which will allow you to quickly search, access, browse, and even generate images of the Pathfinder SST data. Live Access Server (and GoogleEarth): Our colleagues at NOAA's South West Fisheries Science Center, Environmental Research Division have established an excellent Live Access Server which serves many datasets, including some of the AVHRR Pathfinder V5 dataset. Go to: OceanWatch Live Access Server - this customized interface includes GoogleEarth access. They also have a more traditional Live Access Server interface - for direct access to the AVHRR Pathfinder V5 data through it go to http://las.pfeg.noaa.gov/OceanWatch/servlets/dataset?catitem=18. Low Resolution Browse Images: For 1985-2006, Simply click on http://data.nodc.noaa.gov/pathfinder/Version5.0/browse_images and begin browsing through low resolution JPEG images for every data file on the system. Browse imagery for interim 2007 data are also available, at: http://data.nodc.noaa.gov/pathfinder/Version5.0_interim_NOAA18/browse_images and begin Note the browse images for 1985-2001 are more coarse, showing 1 out of every 32 pixels, than those for 2002-2007, for which 1 out of every 16 pixels are displayed. To see a table listing the most current information on the data presently available at NODC , please see the Available Data page. Much of the data for Pathfinder V5 are also available through the PO.DAAC's data access systems. PO.DAAC FTP Server: ftp://podaac.jpl.nasa.gov/sea_surface_temperature/avhrr/pathfinder/data_v5 contains daily all-pixel SST data with quality flags from 1985-current. PO.DAAC POET : http://podaac.jpl.nasa.gov/poet provided sophisticated online display and subsetting capabilities. An error was made in the processing of the reference SST fields (-bsst files) for all Version 5.1 data that created a "halo" of cold pixels around coastlines in the reference field (see figure below). As a result, several anomalously cool Pathfinder SST pixels have passed the reference test during processing and been assigned quality flag values that are too high. Using pixels with a quality flag of 7 does decrease this effect, however there is no perfect solution. This issue affects all Version 5.1 data, and will be corrected for Version 6 of Pathfinder. Daily data: Use Version 5.1 for days 1-9 (1985001 through 1985009). 5-day data: Use Version 5.1 for the first two 5-day periods (1985001-1985005 and 1985006-1985010). 7-day data: Use Version 5.1 for the first 7-day period (198501). 8-day data: Use Version 5.1 for the first 8-day period (1985001-1985008). Monthly data: Use Version 5.0 for all months in 1985. Thanks to Scott Heron of NOAA's Coral Reef Watch project for finding a bad quality flag file: the file http://data.nodc.noaa.gov/pathfinder/Version5.0/Daily/2000/2000294.m04d1pfv50-qual.hdf has a patch of erroneous quality flags extending from Florida, USA through parts of the Gulf of Mexico and down to northernm South America. The quality flags appear uniformly too high. These region is coincident with an area that is missing data anyway, so there are no corresponding SST values but users should take note of this time and region. You can see the problem in the preview graphic: http://data.nodc.noaa.gov/pathfinder/Version5.0/browse_images/Daily/2000/QualityFlag/2000294.m04d1pfv50-qual.hdf.jpg. Users of the data, especially in high latitudes, are cautioned to put a "reality check" on the data even after applying the quality flags. In some cases, the quality checks that would normally exclude unreasonable SST values may fail (the two most relevant checks are the ones on the brightness temperatures and the comparison against the OISSTv2 analysis). In high latitudes where the SSTs can drop to as much as -1.8 or -1.9 degrees C these checks can sometimes fail, resulting in SSTs with values as cold as -2.925 degrees C (pixel values between 1 and 15) that still have high quality levels. Since surface ocean temperatures can not become this cold, these data should be masked out. This problem occurs in the time series data as well as in the resulting climatologies. A problem involving spurious SST gradients has been detected by Dave Ullman and Peter Cornillon at the University of Rhode Island. This problem manifests itself as a jump in SST value every 18 lines and is not clearly visible in a single image. Instead, it was detected using edge detection algorithms which examine sequences of data. This problem is also known to exist in the older 9 km Pathfinder SST data and has also been seen in MODIS SST data produced at the University of Miami. The problem is related to the mapping procedures by which the equal-area space bins in which the data are generated are mapped into the equal-angle, uniform grid space in which the data are distributed. Future versions of the Pathfinder dataset will correct this problem. Biases related to aerosol contamination from Saharan dust storms have been identified in both 9 km and 4 km Pathfinder fields. Techniques to better mask these contaminated pixels and possibly correct them are being investigated. A problem with the landmask was detected and reported by Dohyung Koo at the Southampton Oceanography Centre in the UK. He found two areas which are incorrectly classified as land off the east coast of South America, around the Patagonian Shelf (around 35-50S and 70-50W). 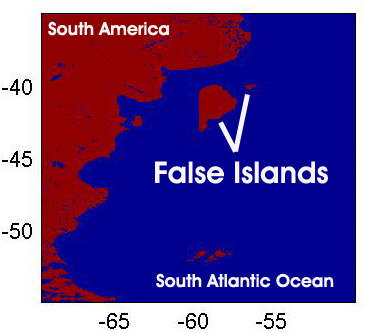 An image illustrating these "false islands" is shown below. 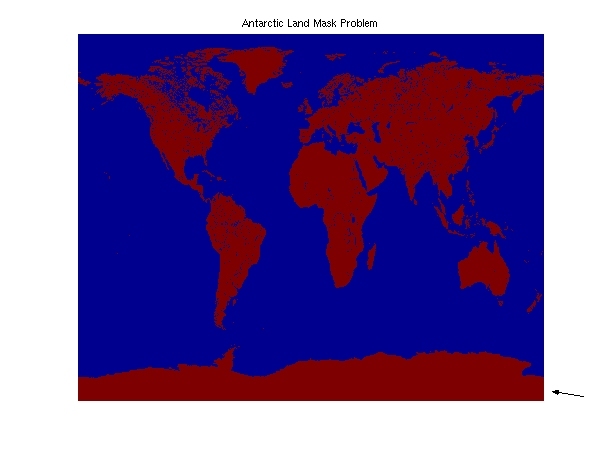 A third land mask problem was identified in the Antarctic. The last column (column = 8192) in the land data file is incorrectly set and indicates water not land. Pixels in rows 3827 through the last row (4096) are affected. The arrow on the figure below points to the area affected, but the area is too small to notice on a global plot. Improvements to the land mask are being developed and will be implemented in a future Pathfinder Verison 6 reprocessing. However, these problem are evident in all of the Pathfinder Version 5.0 data files now available. General Tools: HDF is developed and maintained at the National Center for Supercomputing Applications. For access to many tools and libraries, see their HDF4 web site *. Remember as you are working with these files that they are HDF-SDS, version 4. They are not HDF-raster and they are not HDF Version 5. Matlab: Matlab has many tools for working with HDF files and a complete implementation of the HDF library, which enable efficient and direct access to these data. For a GUI interface, examine the help information on "hdftool", or simply do an "hdftool filename" to start working with a file. You can also do a "help hdf" for general help in using HDF files in Matlab, and doing a "help hdfsd" will show you a list of functions for working with HDF-SDS files. There is also a simplified function called "hdfread" so you can examine the help information on that as well. Example Code in Matlab, Fortran, and IDL is available on the Pathfinder Web Site under the Example Code page.